Beyond: Chapter 4 is the largest and last of the four updates in 2018. The below text is an amalgamation of Frontier’s, my own and other official information taken from the E:D forums. For the most recent changes to this page, please see the Blog Updates section. For the full patch notes, see here. Make exploration more involved: By introducing a process we aim to make exploration feel more meaningful, making the results more satisfying and rewarding. Replace flying time with gameplay: We want to reduce the amount of time you have to spend flying to a planet just to discover it. The only time we want you to fly to a planet is because you want to visit it as there’s something there you want to see or do. Ultimately that will make exploring planetary bodies and getting first discoveries in a system quicker and more engaging at the same time. Remove Random USS Spawning: You will now be able to use your skill to locate signal sources rather than rely on luck. you will have the ability to identify a USS from anywhere in the system and then explore and discover these locations. Reduce the time to find planet surface locations: You will now be able to employ game play to make searching out interesting surface locations/POIs quicker and more interesting rather than flying across the planet in low orbit. Improve multiplayer exploration: With both of the module upgrades we are making sure that wings and multi-crew are supported. Holistic System: The improvements to exploration mechanics tie together not just new discoveries, but mining, missions and signal source location in one package. All new “First mapped”: You’ll be able to add a first mapped across any planet within the galaxy, including within the bubble. Giving all players that have joined the game since it’s launch even more opportunity to make their mark on the galaxy. Nav Beacon: Where a Nav Beacon currently exists it can be scanned to give an a system map. Players will automatically gain the location of starports and outposts when they enter the system. One of the major changes to exploration is the way the the discover scanner works. You can see a full walk through of how this works by watching the live stream video or reading the text below. Frontier have decided to not add new module requirements so Commanders will automatically be given the new discovery scanner upon release so players won’t have to spend time travelling back to a port to purchase new equipment. Additionally they have switched the Discovery Scanner to a built in module, that is fitted to all ships. This frees up a slot for players to use and sees all their credits refunded for any previous purchases. When activating the discovery scanner players will now be taken to an all-new augmented scanning interface and view. Frontier have also partnered up with British Antarctic survey who have catalogues of radio emissions from planets recorded in the universe. Some of these have been used directly or as inspiration for the sounds when hovering over the signals given in the scanning mode. Players are able to tune the focus of your sensors to a particular point on the scale, making emissions from objects at this range much clearer, at the cost of filtering out signals returned from bodies not emitting at this range. As you move the view around, you are aiming your discovery scanner sensors. To aid you, the discovery scanner view also features a repeating sweep of gravitational disturbance detected in the system. You can use this sweep to narrow your search for stellar bodies, as well as start your search around the star’s orbital plane, which is revealed by the initial system scan. Emissions that come close enough to your view’s focus are represented by signature patterns around a central reticule. If you are tuned to the correct point on the energy scale the signal will show as a symmetrical pattern clearly showing the direction towards the origin of the signal, allowing you to locate it. The further away your energy tuning, the more distorted and asymmetrical the pattern becomes, hiding the precise direction and location. Once you have a candidate origin, you can use the scanner to reconstruct a massively zoomed in view. If you aimed precisely enough, you will discover the stellar body. If there are a number of stellar bodies in relative close proximity to your focus, you may need to repeat the process to isolate individual signals. Discovery Scanner construction of an identified planet – In game work in progress image. As you locate and identify stellar bodies their emissions are filtered out, instead becoming markers on the energy range, making it easier to find the remaining bodies. It’s at this point in that you will gain the “first discovered” tag, rather than having to physically visit the planet (you still need to sell the data at a port to gain the tag). All current first discovered tags will remain. Importantly, when you uncover a planet using the discovery scanner, as well as being informed of the resources available on it, the presence of unusual locations, such as Guardian sites, will also be revealed. However, their precise location won’t be shown until you have mapped the planet with the detailed surface scanner. Once a Commander has discovered and sold data about any stellar body, every single Commander’s ship computer will be updated no matter where you are in the galaxy, giving you the basic information for those bodies once you enter the system. This information is similar to the data you currently receive from an initial system scan; many populated systems will provide more data including the name of the bodies. Along with the Exploration update, Frontier are improving the way that USSs work confirming that there will not only be new content for them, but they will now spawn throughout the entire system when you first enter it. The new exploration tools will help players to find USSs throughout the system, not just in the area around you. Players can still interrogate navigation beacons to reveal planets in a system that have a navigation beacon in them. USSs will also start to re-spawn in a system after others have decayed. Whilst USSs do still have a decay time and are commander/instance specific (you can still use wing beacons to allow friends to join you), the timers have been increased to allow you time to find and fly to the ones you are interested in. The decay time is also now displayed when targeted. Signal sources still obey rules determining where they can appear within a system, and mission critical signal sources will still be highlighted to differentiate themselves once located. 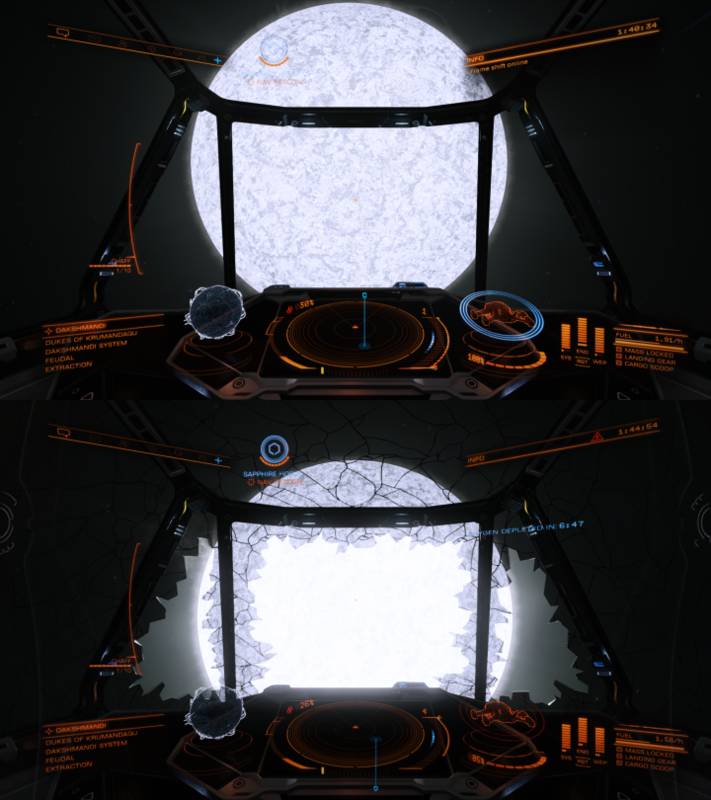 These combat areas can now be found using the discovery scanner no matter where they are in the system. Players can still discover these if you fly close to them in super-cruise. See ‘War’ further down for more information. Missions will now have specially coloured pips and markers to help you differentiate them from other signals. When using the Full System Scanner you will be able to track signals that are not stellar bodies. These other signals will display the location of Unidentified Signal Sources, Conflict Zones, and more. These signals are shown as dotted circles in order to differentiate them from stellar bodies. Once you zoom in on them (as detailed above), you will then be able to lock on to it in order to locate it in Supercruise. This module will not be replaced, instead the detailed surface scanner gains the ability to launch micro sensor probes in super cruise. These probes will be used to “map” a planet’s surface (including planets which are currently not available to land on), and locate resource hot spots in ring systems. The flight-assisted probes are unlimited in use are launched via a new aiming interface when activating the detailed surface scanner. The probes will arc towards a planet’s surface and when close enough will “display” sensor coverage over a large area. Once enough of the surface has coverage, the probes will collate and report their findings. To map rings around a planet you need to hit each ring with a single probe. To allow for skilled play you can aim probes away from the planet, allowing them to arc around it, potentially letting you hit the surface on far side of the planet. If you aim too far away, the probe will fly right past and miss, but by using mass and size information displayed on the HUD you will be able to lob probes and get full coverage without having to fly around the planet. Frontier are adding a new opportunity to get your Commander’s name immortalised in the game with the new ‘First Mapped By’ tag. The first person to successfully map a planet to 100% and sell the resulting data at a port, will be awarded this tag. This also applies for planets that have already got a ‘First Discovered’ tag as well. “Seed the galaxy with a series of unique things to find”. These are in the form of geological, biological, and other phenomena. Video showing a form of lightening can see below or here. Gas cloud as featured in Chapter 4. As part of the exploration update Frontier will be making sure multi-crew members can use the discovery scanner and detailed surface scanner at the same time with all the discoveries being shared among crew or wing. This allows wings and multi-crew to engage in exploration together, each earning credits and exploration rank and making the process more efficient. A schematic version of the much requested Orrery map will be available in Chapter 4. You can see the live stream clip of it in action below. The quarter four update will also see the introduction of some new lighting tech. Specifically this will be a new global lighting model for the entire game affecting both planetary surfaces and how lighting is seen in space. Importantly these will not be static changes but will alter as you fly around systems. Part of the challenge for Frontier’s art team was to “curate the look of the game” throughout its large game area. As a result they have developed some tools to help them do a better job of adapting the contrast, toning and exposure as well as adding a post effect on top of it. This will enhance the “look, feel, mood and tone of the game” and allow surfaces to be coloured for the various sun temperatures in the game. The lighting changes will affect all parts of the game and below are some examples of these changes showing the current lighting against adaptive lighting and adaptive with colour grade lighting. Some early shots (not necessarily representative of the final version) can be seen below. PlayStation 4 and Xbox One (including Pro and One X) consoles will receive all of the graphical updates (that is the lighting adjustments, colour grading and improved fog effects) with the exception of the shadows in fog volumes. These shadows are an Ultra-only setting on PC due to the impact they can have on performance; we’ve worked on carefully balancing the console settings to give players as much as possible in terms of visuals while maintaining performance. For PS4 Pro and Xbox One X consoles running in Quality Mode, the fog is more detailed than in Performance Mode or on the standard consoles, and as usual the overall settings are higher. Activated whilst flying or driving (available for ships, fighters and SRV’s within range of mother ship) this new feature will allow players to fly across unlit surfaces without fear of hitting something unseen. You can see the video clip of this in action below. Players can now “explore through the new volumetric fog effects in rings with striking god rays, and experience light diffusion through the thick nebulous clouds.” These graphical upgrades are dependent on the system you are using. Specifications are not yet confirmed. An example of this (in 4k) can be seen below courtesy of Cmdr Flint on the official forum. There are also now some more subtle effects when a players cockpit is breached. The Codex will log exploration discoveries and give information on your Commander, as well as acting as an encyclopedia to give more depth and context to what you find and hinting at other things that could be found in the galaxy. The galaxy will be divided into 42 regions to help players plot, in conjunction with the Codex, where the discoveries are. The three major sections of the Codex can be seen below along with the relevant section from the live stream. The Commander page is where you can find information about your in-game statistics, a session log of your activity and an archive of audio and text logs. Home Page – In the home page of the Commander section, you’ll find a full length picture of your Holo-me avatar, your current Elite ranks and their progress and an overview of other quick reference Commander stats. Session Log – The session log tracks certain in-game activities based on the already existing player journal. Statistics – The statistics page is a neater, clearer and more concise way of displaying information that was previously found in the right-hand panel of your cockpit. Archive – The archive is your very own library, a collection curated by your discoveries. Any audio and text log you uncover across the galaxy (such as those found from abandoned settlements, Generation ships and other points of interest) will be added here. Audio logs in the archive can also be added to your playlist for easy listening while out exploring in the black! Within Discoveries section, the galaxy has been broken down in to 42 regions. Each region has information detailing the stellar bodies, geological/biological entities and civilisation contained within them. Within each system, there are variety things for players to discover, such as stars, terrestrials and gas giants and more. In each of these will be a list of types which you can select to view more information. As you find new types within that system they will be added to The Codex. There is also additional information such as the largest, smallest or the coldest stellar body found (for example). The Codex also has ‘Rumoured’, ‘Reported’ and ‘Discovered’ states. Rumoured – If an item is listed as rumoured that means there is a possibility of finding it within that region. The Codex has been filled with ‘rumoured’ discoveries in each region to give you an initial breadcrumb trail to follow. Reported – When a Commander finds the rumoured item in question, it then shows up as ‘reported’ in the Codex, and update everyone’s Codex . If you then find it, and scan it, that will then become ‘Discovered’ in your codex. If you’re hoping to be an intrepid explorer and find things that haven’t been discovered, you can – and set off that cycle of Rumoured, Reported, Discovered! The 42 regions are huge, and there is a lot to be uncovered, the initial ‘rumoured’ items are just the very beginning in getting you exploring out in to the black. While you’re out there making incredible discoveries and earning credits you’ll be inspiring other explorers to follow in your wake! The Knowledge-base is your hub for brushing up on Elite Dangerous lore! It contains articles detailing the history of the Superpowers, key figures and characters, organisations and other key powers within the galaxy. It’s also the place for information about the Thargoids and other articles of historic importance. These articles are accompanied with vocal narration that can also be added to your playlist. These will look to add more direction, feedback and reaction to the game. They are different in style, complexity and outcome, with a significant amount of NPC voicing in them (both inside and outside of combat). Players will have the opportunity to find these using the new scanning methods, or by finding them in regular super cruise flight, giving them the opportunity to respond to UI on screen prompts in making decision on whether to help or turn down the chance to become involved in them. “The gruff voice comes in again, suggesting we use our scanner to identify weak points on the megaship. Aha: now the cruiser’s many vulnerable fuel canisters are highlighted for the duration of the fight. We’ll need to blow up 15 of them to bring the megaship to a standstill. As previously these will be found in USSs and will contain a variety of voices asking the player to help out the NPC pilot in distress. If a player chooses to help then the persistent nature of them means that you can do so on the spot, or return to them at a later point providing the timer on them hasn’t run out. In an outbreak system players will be great by a voice over of NPCs requesting food. Again, the player can choose to help via the new UI and either assist on the spot or go to fetch some food before returning to help. Once more players will be given different voice messages depending on what they choose to do. More mega ships and installations have been added to the game including bars, research stations etc. These will be considered assets so these can be fought over and won and lost and will feature in the new scenarios. Megaships will come with planned routes (moving on the weekly tick) and are considered to be under the care of the systems prevailing major faction. The BGS sees some very significant changes in the Chapter 4 update with enhanced feedback as well as changes to system states, war, expansion as well as news and events. From Beyond – Chapter Four onward, factions will no longer be limited to a single state. Instead a faction could be in multiple states per system. For example, rather than being in ‘War’ across all of the systems the faction is present in, the faction will only be at war in the single system in which the war is taking place. This new change means that the faction can also be in several different states at the same time. A faction could be in many different states, such as Bust and Civil Unrest. The Background Simulation is woven into the fabric of the galaxy, and so this change will impact everything from USS spawning to mission spawning. The systems your faction is present in may very well change up! The addition of multiple states means that managing an intergalactic empire will come with increased challenges. In order to make this more manageable we’ve added additional feedback to the game that should make interacting with the Background Simulation easier to understand. Part of this feedback includes how Local News works. Frontier have expanded the faction summary news article, so that each faction has their own individual article which informs players of the states currently active in that system. Economic status – reflects the wealth of a system. Security status – reflects the safety of a system. Conflict – based on the system influence and represents the control of the assets and population in a system. Movement – based on influence and our new Happiness value these states determine the movement of a faction between systems. Other – Anything not included in the above, and reserved for future states that we are not ready to talk about! A faction can have one state from each of these categories active at a time in each of the systems it’s present in. These will affect what appears in USSs, what is generated on the mission board and general traffic in super-cruise making the BGS more dynamic, challenging and engaging. Frontier have done some work done to improve the ‘black box nature’ of the BGS and allow players to have more of an insight into what is happening via in-game menus. The status menu now contains more details regarding the Economy and Security of a system along with showing their ‘Happiness’, which shows the general mood of the population in the system. These new details are represented by simple coloured bars with a marker to show the current situation within a system. As the marker on the Economic bar is pushed upwards, the faction can move into Boom and then Investment. The other end of the Economic bar consists of Bust and eventually… Famine. The Security bar consists of Lockdown, Civil Unrest, and a new state called Civil Liberty on the positive end. Civil Liberty represents a period of safety and freedom for the faction’s population. Squadrons will also have access to this information along with every system the faction is present in. Wars will be played over 7 day period with each day sides fighting to win a certain amount of influence. This will be done by fighting in conflict zones and combat missions. In combat zones factions will face off against each other to win points to secure victory. In the status menu a ‘conflict status’ bar will show who is winning or losing. With multiple states existing this now means that factions can be in as many wars as they are systems. Taking out ‘Alpha Squads’ – highly powered enemy ships will turn up. ‘The King’ might turn up who needs protecting or taking out. Capital ships might also, in specific circumstances appear. Low Intensity combat zones won’t have side objectives, but the Medium intensity ones will have some, with High Intensity ones being most likely to see them occur. Frontier announced some significant changes to mining, adding new ways to find and extract valuable resources as well as introducing increased payouts and a degree of danger to the process which was not previously present. Surface – dense areas of material on the surface of particular asteroids, needing to be carefully broken off to recover. Some concept art of these can be seen below. Deep core – an asteroid with a treasure trove of resources at its core, needing to be cracked open to reach. Each of these will provide increasingly better rewards/materials as a return for the increase in challenge and time and will be distributed within asteroid fields at a tiered rarity; surface being the most common, sub-surface being less so and deep core being the hardest to find. This new HUD mode allows players to locate these new deposits, as well as granting access to all the new modules and functionality. Once in Analysis Mode, the first new mining module to be used in the Detailed Surface Scanner. This (as per exploration) will fire a probe at a planetary ring and highlight areas of the ring that are worth mining. These will then show up in the players left hand navigation panel so they can be targeted. Top Image: Areas of the ring with available resources are highlighted after the probe has done a sweep. Bottom Image: Hotspots showing up in the players navigation panel. Once a player has chosen and flown to an area of the ring to mine they can then use the pulse wave scanner to choose potential asteroids to mine. This is done using the pulse wave scanner which once fired highlights resource rich asteroids in deep orange and yellow colours. Highlight any surface and subsurface deposits. Locations of deposits shown by prospector limit. Surface deposits are dense outcrops of material that are partially visible on the asteroids surface. These can be mined using the traditional mining laser, or by using new tool in order to crack and collect: the Abrasion Blaster. The shots strength will depend on how long the trigger is held for and each shot will reduce the health of a deposit by an amount. Assuming destruction is avoided, the material will be dislodged and create a single collectable chunk. Successfully dislodging a deposit will shoot out a small number of chunks to be collected. This can be collectable as per surface chunks, but in this case the health value will determine the percentage of the particular material in the chunk, the higher the health, the better the quality of the material that can be collected. Subsurface drilling with the depth vs. quantity graph. The final deposit type is the deep core deposit, this is the rarest and largest form of deposit and is actually more of a cluster of deposits rather than a single instance. It requires players to crack open the asteroid to reach. To do this, Seismic Charge Warheads are required to break it without destroying the deposit inside. Below is a brief snippet of video showing the in-game explosion of an asteroid. Once the timer reaches zero all charges will detonate, and depending on the charge level set & the quality of the fissure, each warhead will do a set amount of structural damage to the asteroid. All warheads will be added together to create a total, which will determine whether the asteroid will break open. There will be supporting HUD elements that will warn the player of the risks and the calculated safety distance. Finally, each of these deep core asteroids will have an integrity value, chosen from a range of values for that particular type of asteroid; Icy, Rocky and Metallic. This will be invisible to players, but will create variety amongst the different types of asteroid in the game. Not managing to crack open the asteroid will have a negative effect on its integrity, and ruin the fissures used. Details are still to be determined on this, so no more on this just yet. Once cracked open, inside will be a plethora of collectable chunks & surface deposits that can be gathered up, and will give by far the most materials out of all 3 of the new deposit types. The idea of Squadrons is to provide a series of features that support multiplayer organisation and gameplay as well as competing for top spots in seasonal leader boards. How do I create a Squadron? Creating your own Squadron will involve paying a credit fee (amount to be decided) and then setting the following values and once introduced they will have their own full screen GUI page within the game. When opening this screen you will have the option to search for a Squadron to join or to create your own. Squadron leaders will not gain extra credits or resources for forming a Squadron and there will be no rank requirement in order to form one. The minimum requirement for forming a Squadron is one commander but more than that number will be required for other features (ie a Fleet Carrier, see later). At present Frontier have said the limit will be 250 people per Squadron, but they are looking at increasing this or allowing players to form alliances/connections between them. Squadron name: This has to be a unique name that cannot be changed once the Squadron is created. Squadron ID: A short ID or tag. Language: The primary language the Squadron will communicate in. Attitude: Choose from a pre-set list of attitudes. The list is currently – Relaxed, Family, and Devoted. Tags: Each Squadron will be able to select a few tags from a wider list. This list includes elements such as “PvP”, “Bounty Hunting” and time zones such as “UTC+3”. Superpower: Choose one of the following: Empire, Federation, Alliance or Independent. Once all of these values have been set and the Commander is happy, the credit fee is paid and the Squadron is created. The Commander who creates the Squadron will be automatically assigned as the Squadron leader. Frontier will allow Squadron names to be reserved in advance to avoid ‘name sniping’. How do I find/join a Squadron? As I mentioned previously, if a Commander accesses the Squadron page and is not currently part of Squadron, they will have the option to search for one to join. Using the same fields as listed above the Commander can search by whatever is important to them and will receive a list of Squadrons based on that criteria. The Commander will be able to look a set of Squadron statistics and use this to decide which Squadron they want to apply to. Joining one will be free. Once the Commander finds a Squadron they like, they can send an application. This application will include a small amount of text that, by default, will include some information on the Commander (highest Elite rank, for example) but can also be edited if required. The Squadron Leader (and Officers) will be able to see a list of all Commander applicants and, at this point, can send the applicants an invite. Both the invitee and inviter must be online at the same time for the invitation to be sent and accepted. This option to invite will also be available on other areas of the HUD where Commanders can select other Commanders, for example a Commander’s friend list. We are currently considering capping Squadron membership at 250 Commanders, but we’re interested to hear your feedback on the matter. Can I leave a Squadron? Commanders can leave a Squadron at any time. If a leader chooses to leave a Squadron then they must pass the leadership mantle onto another Commander. If all members leave a Squadron then it will be disbanded and any assets the Squadron holds will also be lost. The only time the leader can leave and not pass on the mantle of leader is when they are the last member to leave (and the Squadron is disbanded). The Squadron hierarchy and privileges. There are currently three classes of Squadron member. Frontier are looking at introducing a couple more of these to allow greater flexibility. Leader: The Squadron Leader has all privileges and can set which privileges officers have. Officer: The Officers have whatever privileges the leader has set for them. Pilot: This is the standard level, and the majority of Squadron members will be pilots. They have whatever privileges the leader has set for them. What privileges can the leader set? This is the current list of privileges but we expect to add more as development progresses and we discover the need for them! Group Comms – A new feature that will be used by Squadrons is group comms, this will add channels and other functionality to the chat panel. When a Squadron is created, the Squadron channel and the Squadron officer channel (which is only available to Officers and the Leader) are automatically created and any Squadron members are added to the relevant channels. This allows Squadron members to communicate regardless of where they are in the galaxy. The Feed – The Squadron overview page (which becomes available once a Commander joins a Squadron) will have a list of automated posts that are added to a feed. This feed will provide essential feedback on the Squadron, the fleet carrier and their activities. For example when a player joins the Squadron a message will automatically be added to the feed. The feed is limited to a certain amount of posts (amount TBD). Those members with the correct privileges will also be able to add a message of the day to the feed, the latest message will always remain stickied to the top of the feed. This provides a place for Officers to provides orders for the rest of the Squadron. We are investigating the possibility of an external Squadrons website. We would love to hear what functionality you would like to see on a Squadrons website. We are aware that some groups will want to align their Squadron with a faction. We are currently looking at how we can make this work and allow Squadrons to ‘fly the flag’ of a faction. This is something we will be discussing during a latter Focused Feedback thread, so please avoid discussing this for now. Frontier will be discussing the issue of notoriety and Squadrons in a future feedback discussion. Transactions – You are now able to apply filters to your transactions tab, so you will be able to isolate whether you want to see such things as your missions, passenger contracts, combat bonds, bounty claims and any fines or bounties you have incurred. Contacts – Contacts now has a context sensitive button that allows quicker access to commonly used actions such as ignoring materials and commodities to scoop and requesting docking. Target – We have streamlined the sub targets and cargo tabs in to one single location now called ‘Target’. After the relevant scans this will now show a target’s sub-targets and manifests (cargo, passengers etc). Comms. Panel – The comms panel now includes a new social tab that encompasses any multi-crew options, any pending invites (wing, multi-crew, friends), and information on any online friends. Squadrons – The Squadrons tab has been added. Please tune in to our later livestream on Squadrons to learn more about this. Home – The ‘Home’ tab contains your ranking information, important information about balance, rebuy cost, notoriety and the ship you’re in. It contains quick access to various features such a GalNet, Holo-me, The Codex and Squadrons. The playlist quick play buttons are also contained in this tab. Fire Groups – Fire groups are now assigned with letters rather than numbers to remove any confusion between fire groups and primary and secondary fire buttons. Ship – The new contextual vehicle (SRV or ship) tab replaces the functions tab with ship functions, pilot preferences, and statistics for the vessel that you’re in. Status – The new status tab now lists information on local system factions, your reputation with the super powers and the Power you are aligned with, a summary of your current session log, your financial information, and any permits you currently have access to. Further details can be found in the Background Simulation & Scenarios Interactions section below. Playlist – The new playlist tab allows you to create your own personalised playlists from the various audio content, including audio logs and GalNet news. Frontier have confirmed there will be two more ships in Chapter 4, the Mamba and the Krait Phantom. Based on an unreleased racing prototype, the Mamba is one of the fastest ships in production. It can also deliver a lot of punishment, boasting one huge and two large hardpoints. This emphasis on firepower and speed means the ship can hit hard and fast, vanishing before the target has a chance to react. Comparisons to the Fer-de-Lance, also produced by Zorgon Peterson, will be inevitable, but the Mamba is in fact faster in a straight line, while being slightly less manoeuvrable. Chapter 4 would see the introduction of a dedicated mission server which Frontier described as below. “In the next chapter of Beyond (3.3), we will be implementing and migrating mission data to a new separate server. While this mainly affects the back-end of the game, you will see some changes to missions in-game. “As it currently stands, missions are on a shared server with other elements of the game. This has the risk of problems with missions causing outages and stability issues for the rest of the game if there are technical hiccups. “So, what benefits will we see by moving missions to their own separate server? Any issue (generated by missions) which can cause a server outage or stability problems will no longer result in players disconnecting. Instead the missions will be unavailable for a period of time. If such issues do occur, the previous servers will be able to act as a back-up, offering better opportunities to recover game content as quickly as possible. We may see a slight decrease in mission board loading times. Missions will now be consistent across game modes (Solo/Open/Private Group). “It’s also worth noting that, as a result of a dedicated ‘mission server’, there will be a removal/significant reduction of the method of refreshing mission boards by logging in and out of the game (“board flipping”). While we understand that this is a practice utilised by some* players, this was never the intended use of the mission system. “Even though there is a small number of players doing this, we will increase the credit payout of missions (by 10%) across the board so all players using the mission boards as intended will see a net profit. As a result of this, some mission reward choices will see boosted influence, reputation and rank gains. As always when it comes to missions, we will continually review and balance them where needed. “Ultimately, this is a healthy step for our overall servers and game experience. As part of the Chapter 4 updates Localised Covas voice packs in French, German, Spanish, Brazilian/Portuguese will be made available. Players can now filter and sort their friends list and private groups they are part of. Players can now bookmark objects which appear in the left hand navigation panel. NPC ships will now take off from a planetary surface when shot at. Orca, Dolphin and Beluga optional internal slots no longer restricted to just passenger cabins. The Discovery Scanner is now a built in module fitted to all ships. This frees up a slot for players to use and sees all their credits refunded for any previous purchases. For our community developers, we’ve updated the login mechanism for the Companion API to use Frontier’s OAuth2 authentication service. Over 2000 bug fixes. See the patch notes for the full list. Frontier announced some changes to how players interact with the Thargoids. These were scheduled to appear in Beta #4 from the 21st November. There will be a live stream on the 22nd November to showcase them. As time progresses, various systems will find themselves attacked by Thargoid Scouts and Interceptors. Commanders will need to defend the system by killing Thargoids, if they fail to kill a certain number of Thargoids, the system will enter a new Background Simulation state: Incursion. Incursion is a system-wide negative background state that impacts all the factions within that system. Players defend the system (before and during Incursion) by killing Thargoids in that system. One starport present in the system (that can be damaged) will be damaged. Each week that passes whilst Incursion is active, a new starport (that can be damaged) will be damaged. If a starport has been fixed after being damaged but the system is still in Incursion, it can be damaged again the week after. All megaships in the system at the point of the state enters Incursion, will appear damaged and unable to continue on their journey. Thargoid Scouts and Interceptors that were found in the initial attack will continue to have a presence, but stronger Thargoid Interceptors will now also make an appearance. Thargoid Conflict Zones will also be found in the system, which pits players against Thargoids in waves of combat. The Incursion state lasts (currently) indefinitely until players remove it. To overcome the Incursion state, Commanders must kill Thargoid Scouts and Interceptors. The amount of kills needed to remove the Incursion state varies from system to system.